After an 18 month pause, work is starting up again, with an eye to getting the truck on the road by the end of the year. 20 April 2007 Car arrives in Warrensburg, Missouri from San Diego. 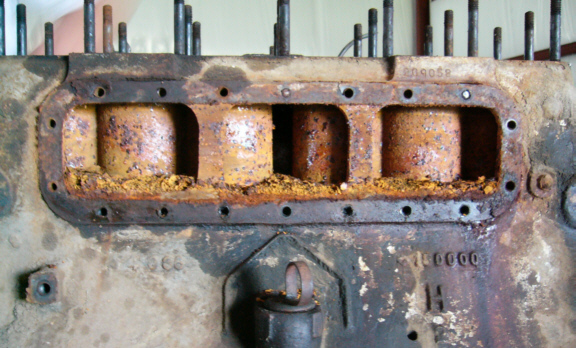 30 Nov 2007 The engine water jacket was clogged with a mess of rusty particulates and 'stuff'. 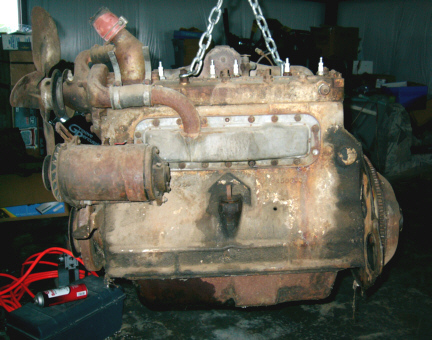 The Number one piston and the connecting rod for cylinder 6 had to be replaced. One of the first things I did was send the dash cluster off to be refurbished in Arkansas. When I got it back, it went back inside for a few minutes. 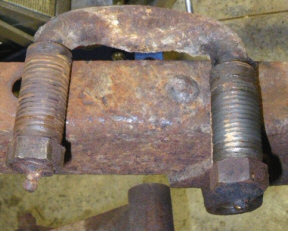 All shackle bushings were replaced. Most all were completely shot. There were complete assemblies being listed on ebay for $90+ each, but I got a complete set of just the shackle bushings from Rare Parts in Sacramento, CA for about $12 each. They fit perfectly. It really does pay to shop around a bit when getting parts for these things. 28 Feb 2010 Tim reports good progress on removal and replacement of rusted out sections of metal. There was a lot to replace, but the gas tank strap attachment points have been restored now. The U channel under the floor connecting to the seat frames had to be replaced, and we found excellent replacements at Mill Supply (rustrepair.com). They were a bit oversize, but still fit just fine. Continuing progress on removal and replacement of rusted metal. The frame is essentially completed now. All cracks repaired and the frame beefed up here and there. Brake lines replaced, shocks installed - looking pretty good. 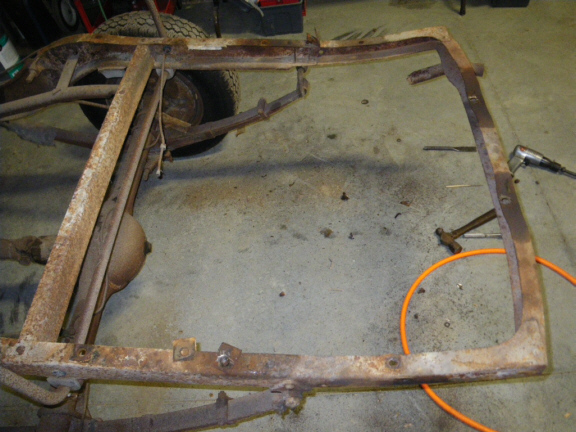 The body is now back on the frame, for good. Tim's still working replacement of rusted metal. Obtained a set of '36 correct wheels from Tom Pett in Illinois and they're at the powdercoaters now. They were baked and then blasted to clean them up. The wheels are back from the powdercoaters. They're a nice dark red color to match with the maroon color planned to go back on. 05 Apr 2010 Finally found a replacement right rear fender. The original is really trashed and beyond repair. The right rear seems harder to come by than others - not sure why. Seats are being redone at a local upholstery shop. Doing them up in medium, aged leather. 15 Nov 2010 Received the rear stabilizer arms from Rare Parts. Much beefier than the originals, and they fit just fine. They are great guys, and they know what they're doing. 14 Feb 2011 Got a replacement clutch plate from Ron Fellows in Texas, and it fits great. Great service and a great price! When I first bought my Airflow, one of the first batches of parts I bought, in early 2006, was from a guy in Minnesota who had a box of Airflow parts and a non-Airflow heater. I bought the parts, and not caring about the heater, I boxed it up and it went on the shelf, forgotten about. 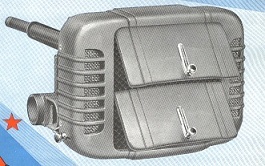 Then in March 2011, I noticed a photo of the heater Hudson Dealers were selling to go in their cars. I recognized it, and remembered the one I bought years ago - sure enough, it was a Hudson Terraplane heater, bought years before I got the car to go with it. Refurbished it, replaced the core and painted it Hudson brown, it's ready to go in. 07 Mar 2011 Paul & Tim achieve First Motion on the Terraplane - it moves under its own power for the first time since 1951. Initially it smoked quite a bit. But the culprit turned out to be old oil and other material inside the muffler which smoked heavily once it warmed up. After a while it burned away and the smoke output, while still present to some degree, is very minimal, and quite acceptable. 04 July 2011 Engine work and initial bodywork completed. 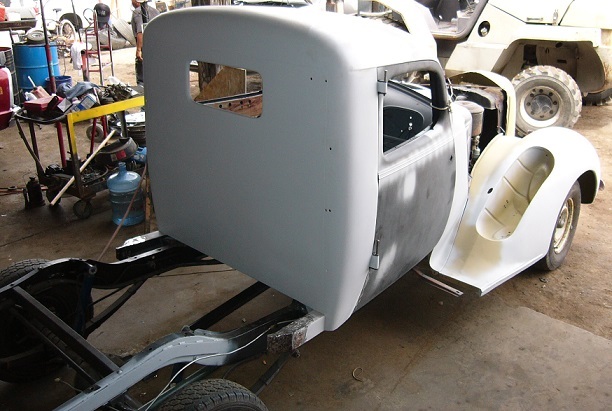 We partly reassembled the car, fenders, running boards and trunk, to drive the thing with more mass and to get it ready for transport to another shop for final bodywork and paint. We relocated the battery from under the front seat into the engine bay. We also drilled holes in the firewall to mount the heater, and installed for a check fit. 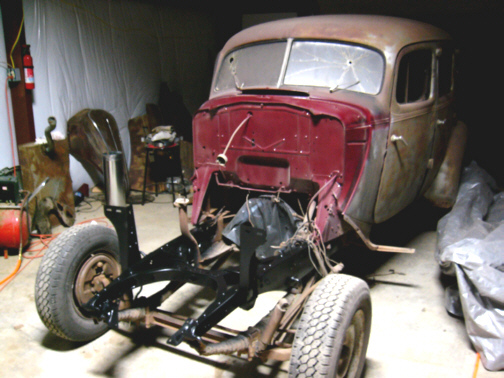 The sedan project car goes into storage for a while, and some body work is done on fenders. 30 Apr 2014 The pickup arrives in Palmdale. Rust is 'so bad', and most body metal is pretty rough. However, the key parts, which make the pickup a 'Terraplane pickup' are there and completely usable. Disassembly begins, for replacement with sedan donor parts. 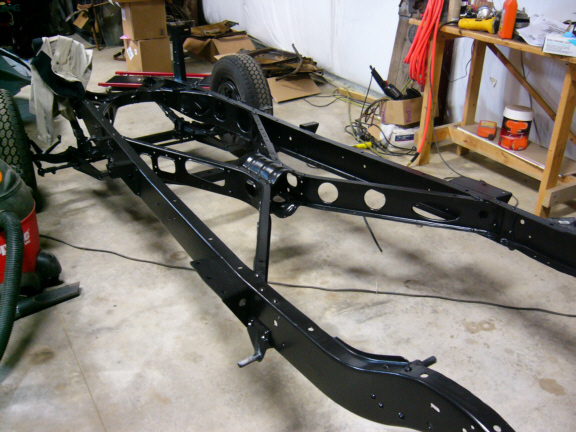 Key external parts include the original rear bumper (shorter than sedan's), the original tailight, frame bolster plates over the rear wheel arch, additional leaf springs, external spare mount, rear license plate bracket, and misc assembly hardware for the bed. However, the gas tank was missing, and the filler neck. The front grille wasn't salvageable, but replaced with the sedan's. BUT, the GOOD news is that it had the correct truck hood ornament, instead of the passenger car ornament you see on some of the other eight Terraplane pickups. 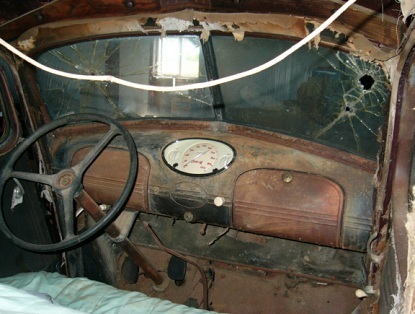 Key interior parts that are present include the scarce two-part, individual seats, overhead headliner and rear corner struts, rear cabin plywood wall, braces for the bed attach points, rear window frame, and cabin backshell, are all there and can be re-used. OK, the plywood wall was really toasted beyond reuse, but still provided all the dimensional info needed to replicate a new one. 10 May 2014 The sedan arrives from Missouri. Both cars are sent to a body shop in Lancaster where the major surgery was done. Yeah, I ended up losing some areas of the sedan that had already been worked on, but the trade off is worth it. I also notified the national HET Club of the presence of the Terraplane pickup, and described that the sedan previously recorded was becoming the donor car. (Better a rare pickup than just another sedan). 30 June 2014 All of the steel in the bed was completely rusted and unusable. But since it was straight, flat metal, it was possible to get parts replicated in Lancaster, CA, accurate to within 1/16 inch. 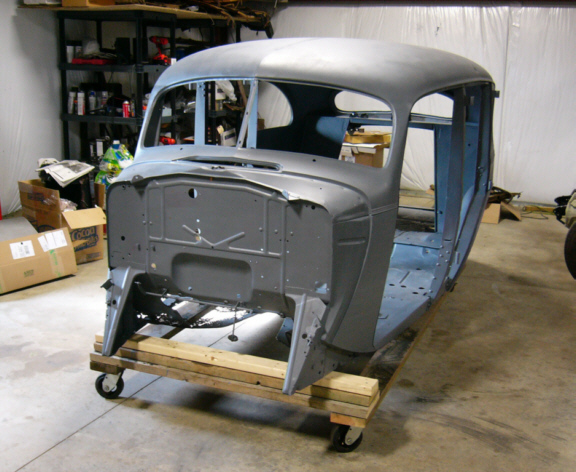 By 30 June, all major parts had been replicated, including the tailgate, removable tool box shells and underneath support box. I then had them beaded and epoxy primered in Palmdale. The replacement bed will be good to go. 04 Nov 2014 Picked up an external spare tire trim ring from the Hudson experts in Fontana at a really good price. That was the only other thing missing from the pickup. 20 Feb 2015 Had the passenger car front grille rechromed in LA. The transformation of that piece was amazing - looks brand new. 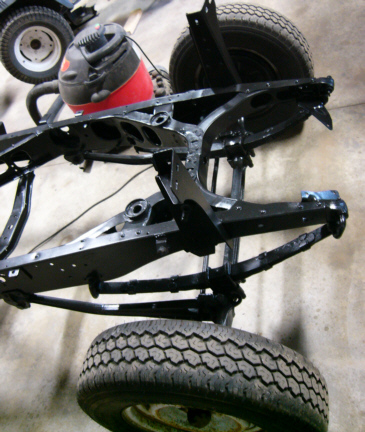 10 Mar 2015 Had the front and rear bumpers rechromed in Bakersfield (both original to the car) and bumper brackets beaded and primered. Good to go. 10 July 2015 Had the rare truck hood ornament rechromed in LA. Looks brand new, but it's cast brass, so its restoration was easy and cheap. 05 June 2016 Having some smaller bed pieces fabricated at a local metal shop, and took window chrome parts down to Van Nuys for plating.